Glass beads by Desi, 2014. Fresh out of the kiln and needing to be cleaned. I love colour. I love beads. I love glass. I love creating and trying to discover hidden properties in ordinary substances. I love to create chemical reactions and patterns in glass that will only occur when there is just the right amount of heating and cooling in place. I both love and hate the “this is not meant to happen” moments when you work with glass and fire. Sometimes those unplanned moments can be magic and sometimes they can be a blob of burned glass. Over the years a lot of my glass beads have gone to waste because I tried to push a reaction into glass for a little too long. Artists should push the envelope every now and again to see what glass can do. I push it too far, too often and then I think oops, too far. Next time I’ll get it right. I’m that kind of person. I have a lot of bead accidents sitting in a jar looking horrible. I love opaque glass and I love to work with creamy muted tones more than bright vibrant colours. It appeals to my love of earthy colour palettes. 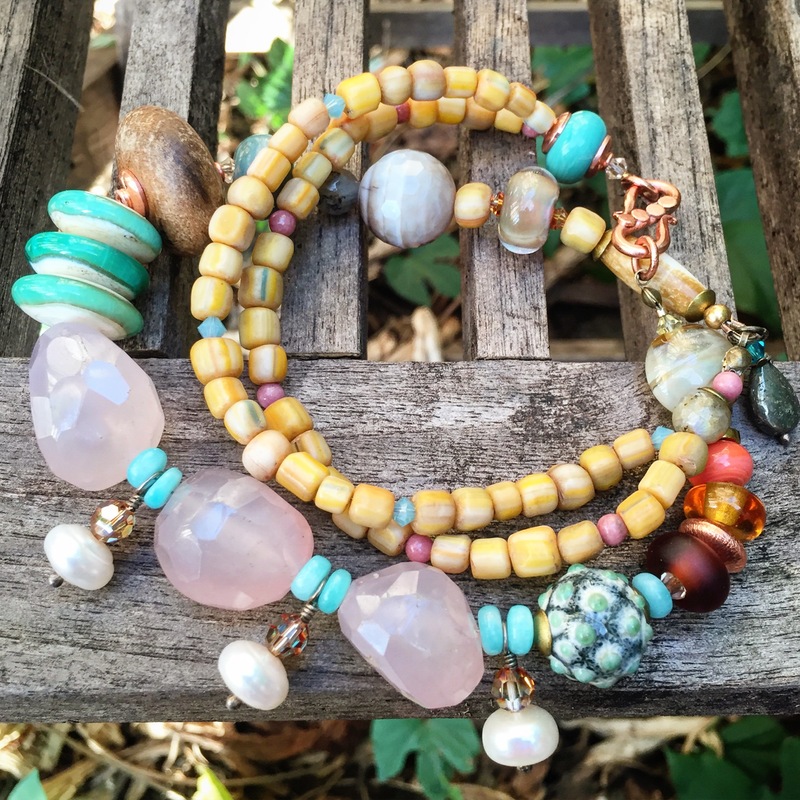 I don’t have a definitive style, there isn’t a bead I make that could be defined as something I made. 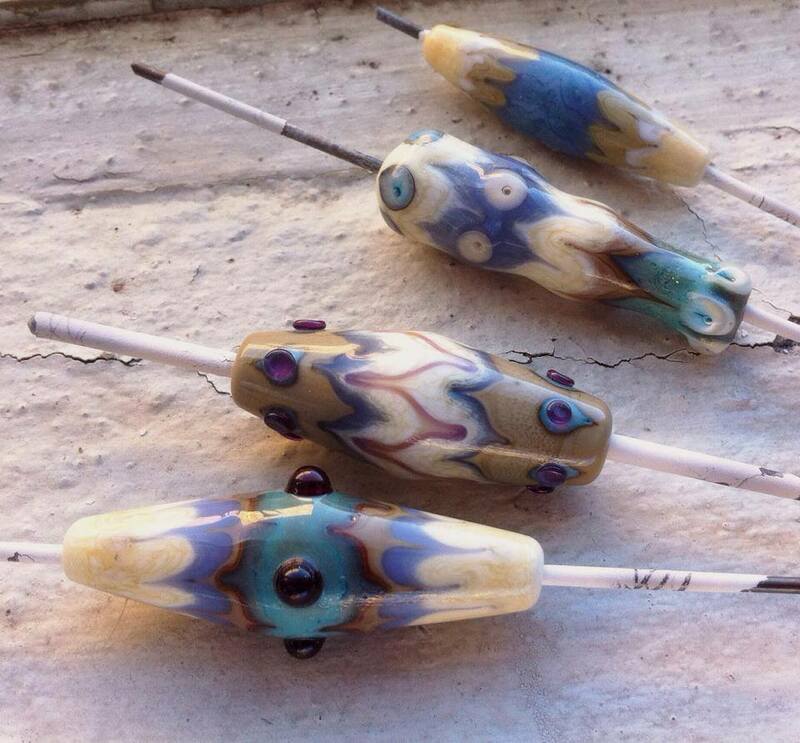 I’ve been lampworking for ten years and I’m still searching for what defines my style. I prefer to gravity shape beads, but I do like using presses for consistent sets. I love all brands of glass that I have tried. I don’t hate one brand over another. Glass has it’s quirks and I love that. A few shattered beads are not going to stop me using a brand or experimenting with putting that brand with another brand which is why I usually end up with some crazy combination that I can’t ever replicate. My mind is very disorganised but the space around me is neat and orderly. I can’t work in chaos because my imagination is chaos. I sit down to do one thing and end up with something else. 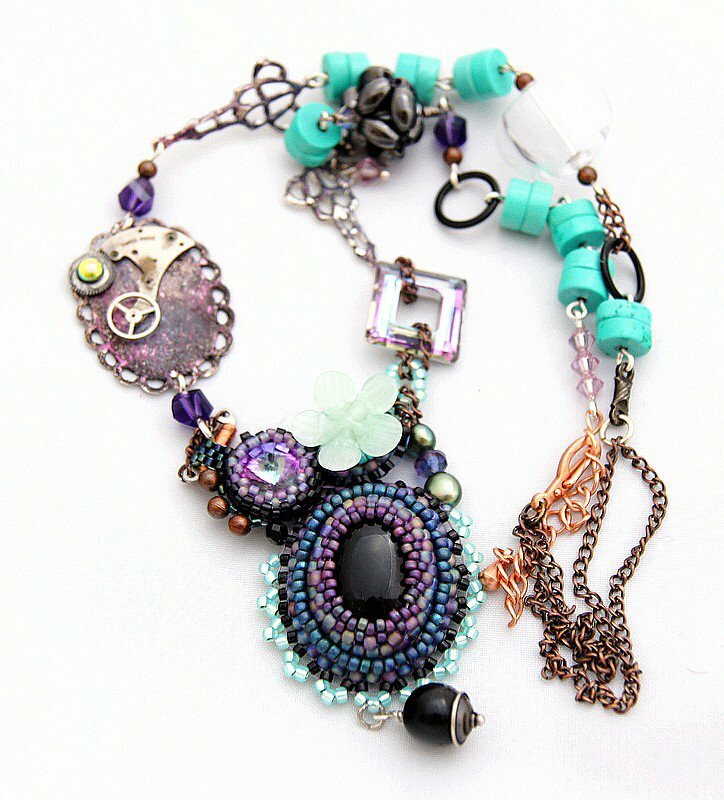 Time Traveller’s Talisman – 2009. My philosophy is to go where the glass takes me, sometimes I might not like those outcomes but they’re important discoveries. I believe I’ve learned a lot from pushing the envelope by mixing glass brands, a lot about how different brands work together and how heat control and soaking can mean the difference between beads cracking or not cracking. 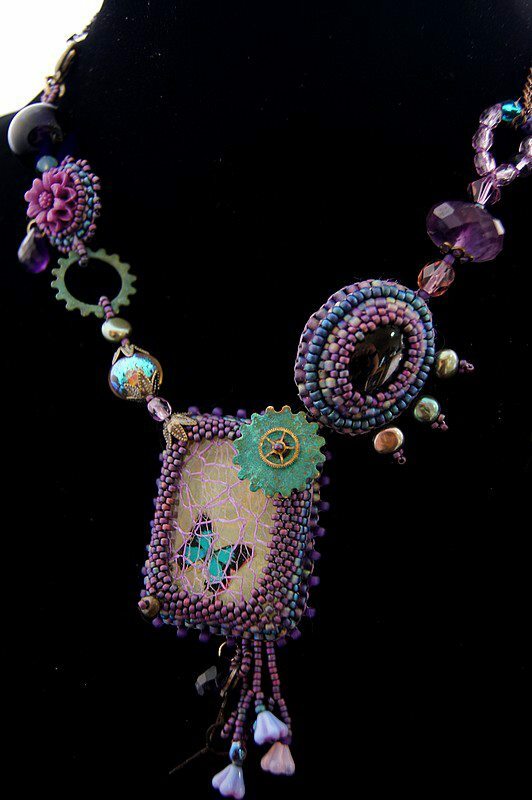 Before I made glass beads I created beaded jewellery out of seed beads. I’ve won a few Australian awards for my seed bead work a long time ago. My work has been part of Australia wide exhibitions and I’ve had my jewellery, glass beads and tutorials published in Australian magazines. 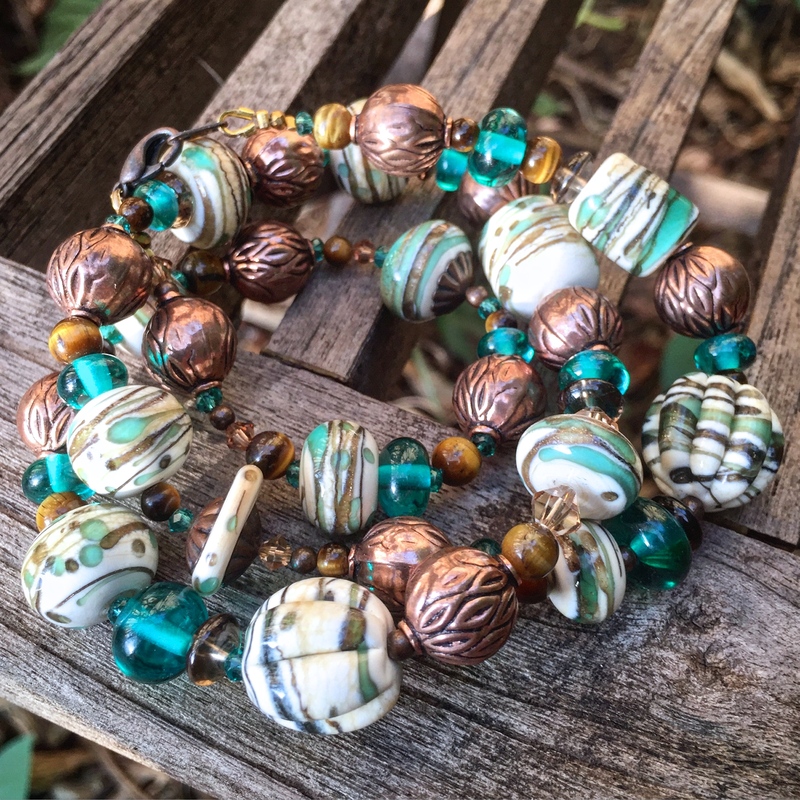 My jewellery appears every now and again in galleries around Melbourne and I’ve had the opportunity to teach bead embroidery and bead weaving around Australia. Although I do not contribute seed bead work anymore and whilst I still enjoy making this style of jewellery, melting glass is my all encompassing love. I never was motivated to contribute to international competitions and I am still that way. I enjoy making art and sharing knowledge, but I’ve never been much for chasing the recognition of that. I prefer to do my own thing and not worry about making something that would win competitions. 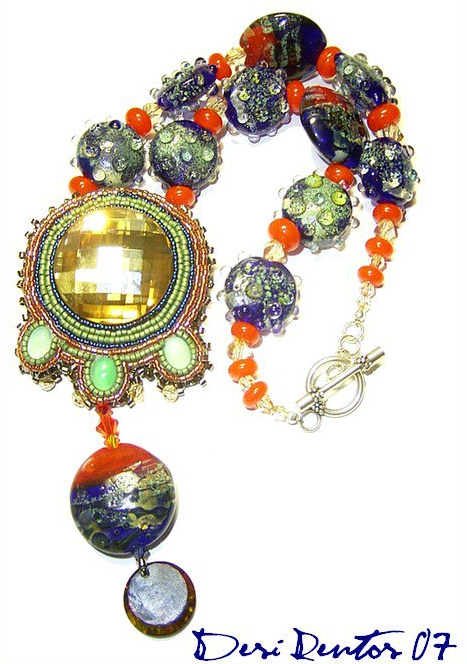 In 2006 I took a bead making class known as lampworking with glass artist Pauline Delaney. Over two days I learned how to make glass beads. I was mesmerised by what happens to glass when heat is introduced. By the end of that year I had a complete set up in the corner of a spare room and was making beads. Working with glass made me want to learn more, but sadly because I didn’t have a safe place to work for a long time, I couldn’t lampwork for a few years and I went back to university to change my career which meant I had even less time. I talk about this in my blog, because I felt that having my own space was an important part of becoming an artist. My career is as a full time high school teacher, which often doesn’t leave me a lot of time to make glass beads. I love preparing my students for university and their lives beyond formal education. I devote a lot of time to it and that comes at the cost of spending more time at the torch. If I were to fast forward to now, I couldn’t have foreseen how all the things that I learned about working with students and teaching could also help me slow down and really look at what I’m doing with glass. I also couldn’t have imagined that after lots of stops and starts with lampworking that I would now have a proper studio in Richmond and be able to spend most of my free time testing glass and bead making. I would love to just make beads all day but I would truly miss being a high school teacher. Beaches on Mars, 2007. Proof that I eventually got the knack of making lentil beads. As I don’t have another lampworker living near me, I find it hard to photograph tutorials. Being in Australia and having such a busy work life, I’ve also found it hard to engage with the international artists who tour Australia occasionally to teach. In 2015 I finally got my first lesson with an international teacher and I was extraordinarily lucky to score a place in a 2 day class with Kim Fields. Apart from this short weekend with Kim everything I’ve learned has been from my initial lessons with Pauline Delaney, tutorials and book purchases or through generous sharing of knowledge on Lampwork Etc, Youtube channels of other artists and reading books and blogs published by accomplished glass artists. I would love to share my own tutorials for how to make the beads that I do, but my husband doesn’t have the patience to sit and photograph whilst I work and the dog is a terrible photographer. Thanks for reading about me and looking through the blog, it’s only beginning to be filled with all the information I’ve accumulated over the years. I hope it’s useful and I also hope that you feel welcome to contribute if there is a factual error or something that I’ve missed. My blog is really about the things that I’ve done as an artist and I’ve done a bit, but not everything. I sincerely hope that you discover inspiration or information that will help you on your creative journey.